In 1946 an alien virus released over Manhattan changed the world forever. Ninety percent of the people exposed to the wild card virus died, and some say they were the lucky ones. Of the survivors, nine out of ten were mutated into "jokers," hideous freaks. Only a rare one percent became "aces," people gifted with superhuman powers. 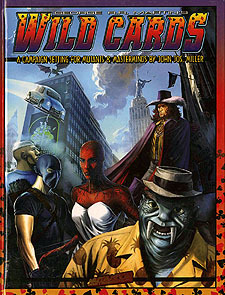 A complete history of the Wild Cards world, from Wild Card Day in 1946 up to the present. Details on the effects of the wild card virus and the creation of aces and jokers. Profiles of dozens of major Wild Cards characters, including M&M game stats. Everything you need to create your own Wild Cards series for Mutants & Masterminds, including how to transform yourself with the wild card! Random systems for assignment of ace powers and joker mutations. The introductory adventure "Ante-Up" to get you started in the strange and wonderful world of Wild Cards. Experience super-powers and Mutants & Masterminds like never before by exploring a world where the luck of the draw means the difference between fame and power and a terrible genetic curse. Draw the wild card and see what you get.